Corn dogs have always been a classic favorite, and for good reason. They may not be healthy, but good grief, they’re delicious. As I was on my way to the grocery store today, different ideas of appetizers were flowing through my brain. The Crescent Roll Mozzarella Sticks have been a HUGE hit every time I make them, along with the Apple Dumplings. The great thing about all of these recipes is the fact that we’re using the refrigerated crescent roll dough. That is some versatile stuff, lemme tell ya! Whether you’re rolling them up with fillings (like the Cinnamon Crescent Rolls with Cream Cheese Glaze) or flattening and layering them with other deliciousness (like the Sopapilla Cheesecake Pie), it’s easy and incredibly yummy. Well, hot dogs were flowing through my brain, because my little pumpkin loves hot dogs. Then, I started thinking about rolling those in crescent rolls. Oh…yeah, I’m going to try that today I thought as I pulled into the parking lot. So, in I went, and came out with my needed ingredients. I couldn’t wait to get home and try them out. 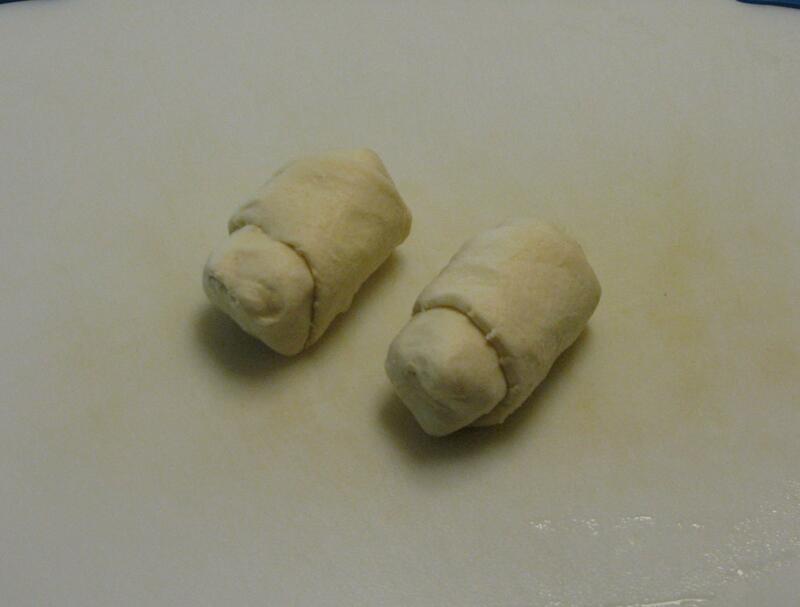 These are also a larger alternative to Pigs In A Blanket, but they’re even more filling. First, you unroll your crescent roll dough onto a flat surface. I usually use a cutting board. 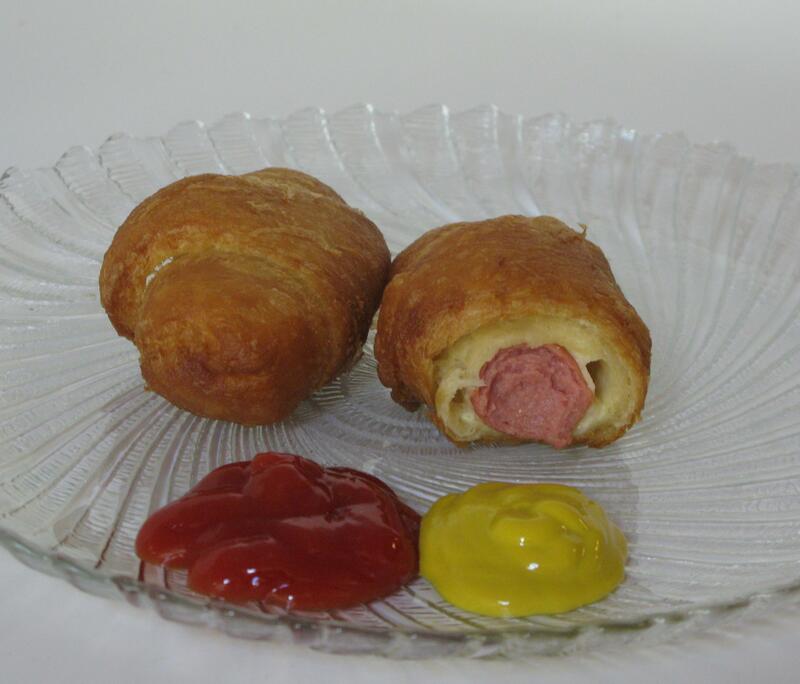 Cut a hot dog in half, place at base of crescent roll, and roll up. 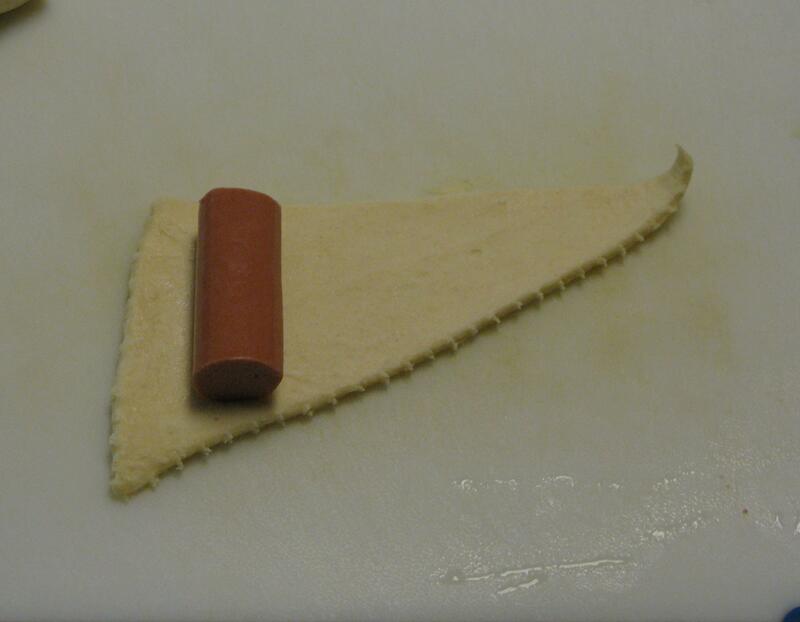 Make sure to seal the edges so the entire wienie is covered up. Now, here’s the part where YOU decide how to want to cook them. You have two options…bake or fry them. Obviously, baking is much healthier than frying, so the choice is yours. Baking is also a lower maintenance, and you can pop them all in the oven at once and walk away. When these are fried, they have a crispy, flaky crust. And here they are! These particular ones were fried. The great thing about these is the fact that you can make as many or as little as you want! These would be great as an appetizer or even an entrée. Hope you enjoy them as much as I did! If you’re going to bake them, go ahead and roll out your doggies. Preheat your oven to 350 degrees. Grease a 9×13 inch baking dish, and place them seam side down in the dish. Brush the tops with a little bit of olive oil, this will give them a little bit of crisp on top. You can bake up to 16 at a time in the 9×13 inch dish. Bake for 15-20 minutes, or until the tops become a light golden brown. If you’re going to fry them, heat your oil to about 370 degrees. Fry in the oil for 3-4 minutes, turning them to make sure they’re evenly cooked on all sides. When finished cooking, place on paper towels for the excess oil to come off.